Society Garlic is an attractive clump-forming perennial plant that comes from South Africa. 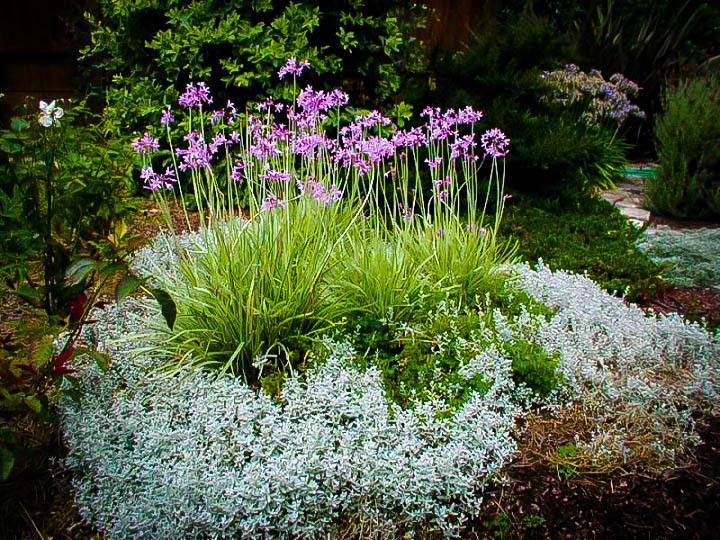 It makes an upright clump of narrow, gray-green leaves, topped with spikes of violet-pink flowers that keep on coming and coming all summer and fall. It thrives in zones 7 to 10, and even in cooler areas. In any zone at all it can be grown in a pot and stored in a frost-free place over winter. The more sun it gets the happier it is, and it grows well in dry areas, needed only minimal watering to keep it growing and flowering month after month. Plant it as a border along a path or bed, grow it in clumps in any sunny part of your garden, or put it in a pot near the kitchen door. It can be used as a mild substitute for garlic in any recipe, working especially well in salads and soups. Both the leaves and the flowers can be eaten, and the flowers make a wonderful edible garnish on a dish. Plant Society Garlic in any well-drained soil. It grows best in sandy to loamy soils, but it will grow in any soil that is not wet. It has no pests or diseases, and it repels moles. Not only is it ignored by deer, the smell keeps them away from other plants they might otherwise eat. Water regularly during the first year, but after that watering is only needed at the height of summer. 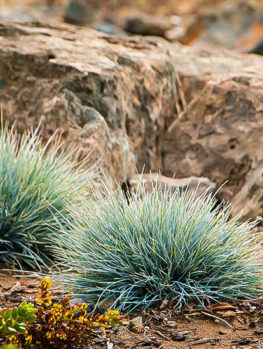 In cooler areas cut back the foliage as it dies in fall and put a mulch over the root-zone. 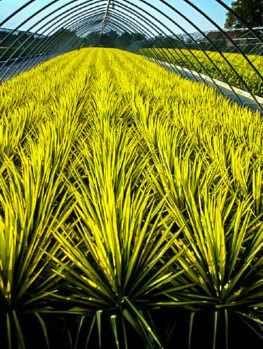 No other care is needed for the reliable and easy to grow plant. Most edible plants may look OK in a vegetable garden, but they are usually not particularly attractive. With Society Garlic you have something different; a plant that is truly beautiful anywhere in your garden, with sprays of brilliant blue flowers, and a plant that is also edible. Its mild garlic-onion flavor can be used for flavoring all kinds of dishes, from soups to salads, in the kitchen. This truly is both a useful and attractive plant, all at the same time. 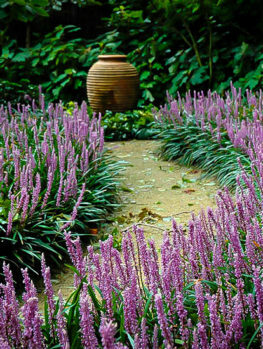 Although you can certainly build an attractive garden entirely out of trees and shrubs, so much more is possible when you add ground-cover plants and other lower-growing flowering plants. 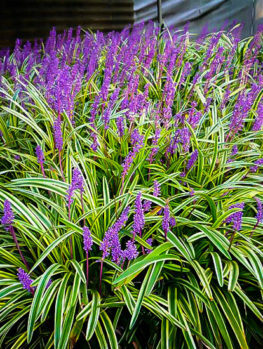 These create a whole extra dimension in the garden, filling the spaces between your shrubs, adding flower color, and making a much more attractive picture. Usually we want to do this without adding extra gardening work, and Society Garlic does that – it gives us color and interest with virtually no extra maintenance needed. Society Garlic is a clump forming perennial and bulbous plant, forming an upright clump of narrow gray-green leaves about a foot tall. Throughout summer, flower stems grow out of the clump, reaching 18 to 24 inches tall. These are topped with a cluster of between 8 and 20 flowers, each one about 1 inch long, and an inch wide. They flare open, forming a star-like shape with six pointed petals. 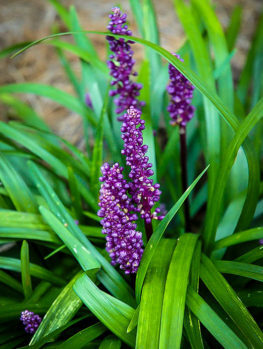 The color is violet blue to violet-pink, and with many flower stems forming over a long season, this plant is colorful in the garden month after month. Use Society Garlic all around the garden. 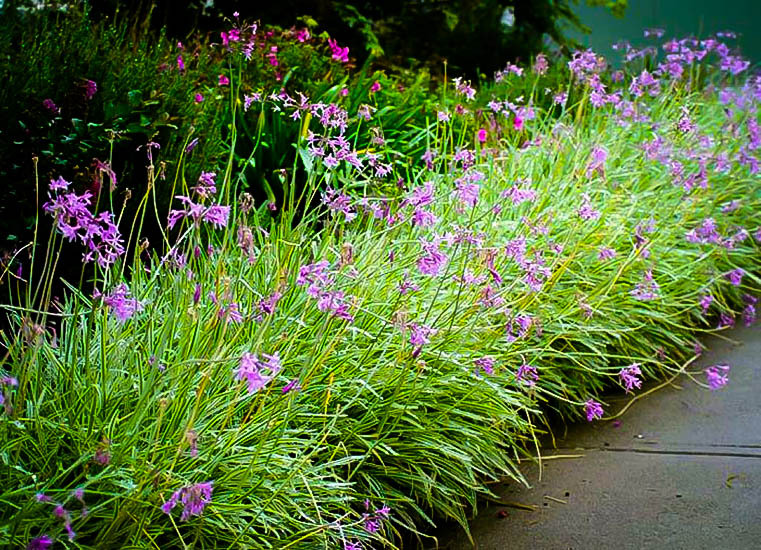 Plant it in a row along a pathway, or to edge a bed. 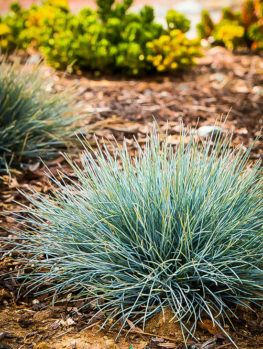 Plant clumps in areas mulched with gravel, along with other plants that enjoy sunny, hot places with minimal watering. Mix it into flower borders with other flowering plants and shrubs. 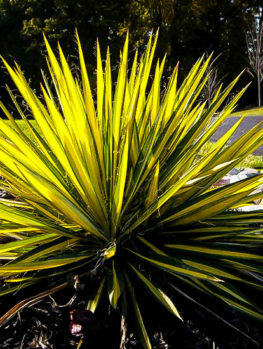 Use it in planter boxes and containers, around the base of taller shrubs and small trees. Since you will want to use it in the kitchen, plant it in your herb garden, or in a pot by the kitchen door. Wherever you plant it, the cheerful flowers will be sure to please, and with no pests or diseases, and not eaten by deer either, this is a very easy plant to grow. All parts of the plant, both the flowers and the leaves (and even the underground bulbs) can be used as a substitute for garlic or chives. It is also said to keep moles away if planted in your vegetable garden. Not only is Society Garlic not eaten by deer, but the smell deters them from coming near, protecting other plants around it. Society Garlic is hardy from zone 7 to zone 10. In warmer zones it is more or less evergreen, with the foliage remaining mostly green all winter. At the cooler end of its hardiness, the leaves will die, and should be removed, leaving the clump bare for the winter. Don’t leave it sitting under a mound of slowly rotting foliage, as this can harm the bulbs under the ground. In zone 6, and even in warmer parts of zone 5, it may also be possible to grow this plant in a sheltered spot, with a mulch of tree leaves over it for protection during the coldest months. Another way to grow this plant in colder areas is to grow it in a container. Once the foliage has died down, bring the container into a cool place, ideally between 40 and 50 degrees, but certainly not below freezing. Keep the pot dry, with minimal or no watering, and no light is needed. Once outdoor temperatures are above freezing, bring the pot outside, water it, and new growth will soon be seen. Society Garlic should be planted in a sunny spot (although it will also grow in a little shade, it flowers best in full sun). It needs well-drained soil for good growth, and does best in lighter, sandy or loam soils, perhaps enriched with a little organic material. Once established it is drought resistant, although plants in containers and pots should be watered enough to stop them from drying out, and garden plants will grow better, and continue to flower more, if they are watered from time to time. Society Garlic is so called because its mild garlic flavor does not stay on the breath, so eating it is not offensive to other people. 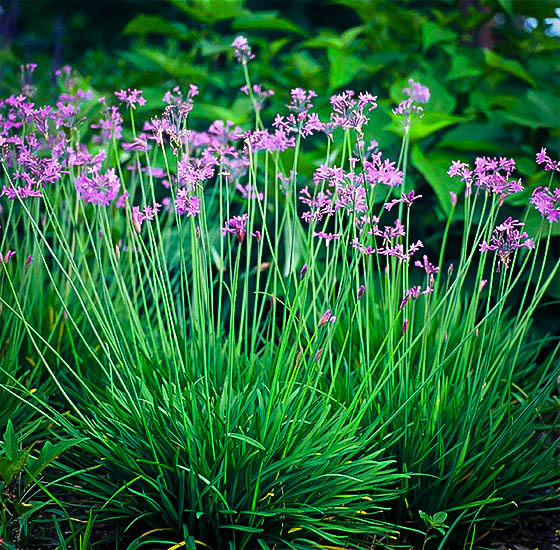 This relative of chives, and a member of the onion family, is known as Tulbaghia violacea. It comes from the grasslands of southern Africa, and it was named after a governor of that area, from the time when it was under Dutch control. His name was Ryk Tulbagh, and he died in 1771. All of our Society Garlic plants are grown by division of top-quality plants, not from seed, which produces variable plants of uncertain garden value. 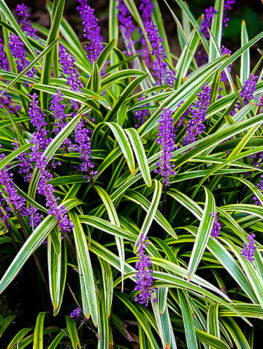 Easy-to-grow plants like this are always in high demand, so order now while we still have plants available!